Gordon Moore 3 January 1929 American Entrepreneur, Chemist, Computer Scientist,Businessperson Entrepreneur, computer scientist and businessman better known as the co-founder and chairman of the famous Intel Corporation. He also invented the Moore's Law. 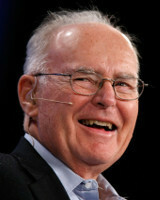 A list of popular Hindi Gordon Moore quotes are given below.